April and May have quite a few holidays here in Thailand. Days off can be strategically taken to have, for example, a five-day weekend using only one vacation day. Since I am still relatively new at my job and am saving up my vacation time for my family’s visit this summer, I am not taking any time off. 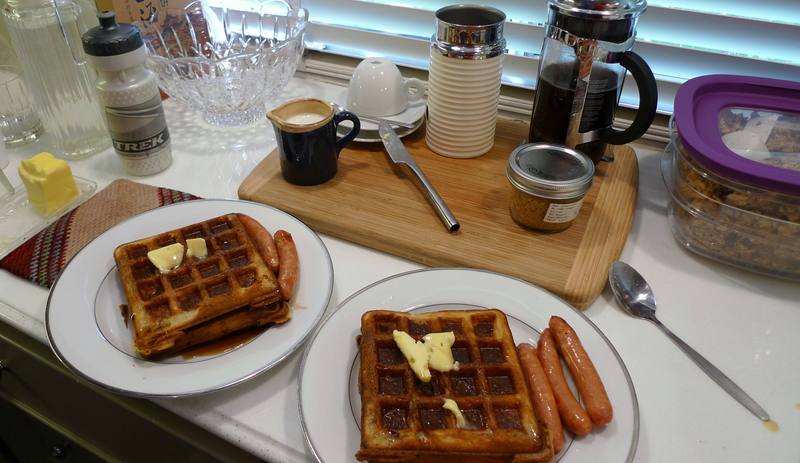 But I did decide to celebrate the long weekend by making waffles for breakfast. There are countless recipes for waffles, but I quite like the one on the Pioneer Woman Cooks website. Ree Drummond’s recipes are well tested and her waffles are light and crisp, exactly the quality I admire in a waffle. The trick is to whip the egg whites into stiff peaks and then fold them into the batter just before cooking. This helps the waffles puff up instead of turning soggy. Truthfully, I’ve not sure that waffles are as great a breakfast choice as they may have once been. I am reaching an age where a heavy, carb-loaded breakfast doesn’t give me strength to go out and plow a field. It just gives me the strength to take a long nap. Which may be perfectly fine since it is a long weekend. 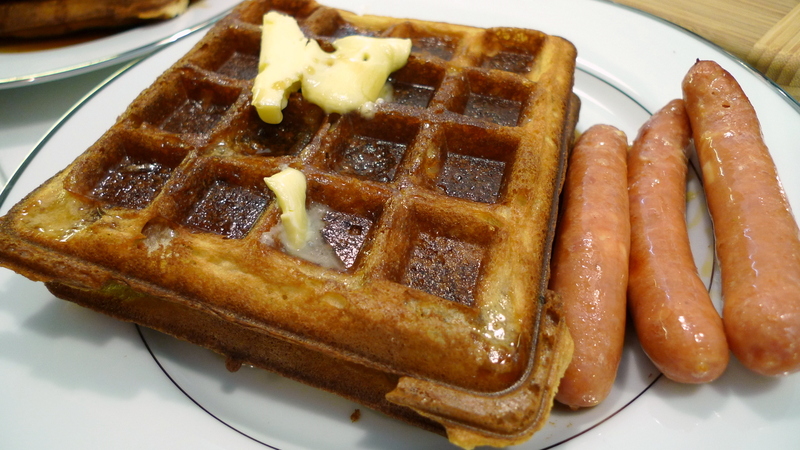 This entry was posted in Cooking and tagged breakfast, waffles by christao408. Bookmark the permalink. Yeah, they were pretty good! Thanks! Actually, it was a bit too heavy on the carbs and kind of threw my energy off all day. Exactly. It really is too heavy. Oh yum!! We had french toast and sausage. I am at the age where a nap is a normal part of the day. It is pouring down rain here and we are staying in watching movies on HBO. I think I’ve always been at an age where a nap is a normal part of my day. Sadly, they don’t approve of naps at my job, although I would like to convince them to create a nap room. Pushed all the right buttons with that pic. Mmm. Glad it worked its magic!